Cassandra Raby is a PhD student at the University’s Institute of Integrative Biology, studying the ecology of parasites in primates. 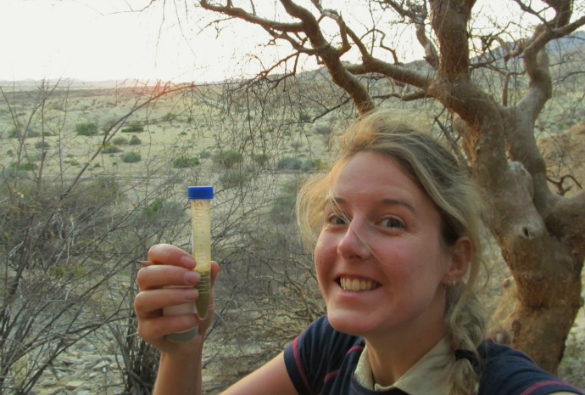 Cassandra recently completed six months of fieldwork in Namibia, Africa, working on the ZSL Institute of Zoology’s Tsaobis Baboon Project, a long-term study of wild chacma baboons. “Baboons are an ideal species to study disease because primates share some of the same parasites as humans. 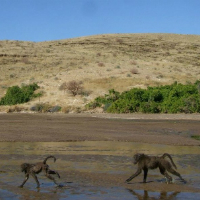 The habituated baboons on the Tsaobis Baboon Project allow researchers to follow them without disruption to their everyday lives, and because of this we can record their natural behaviours and social interactions. The field site is located in central Namibia, on the edge of the Namib Desert where the environment can be highly variable. Exploring the baboons’ wider environment enables us to understand more about them, in particular the ecology of their diseases. 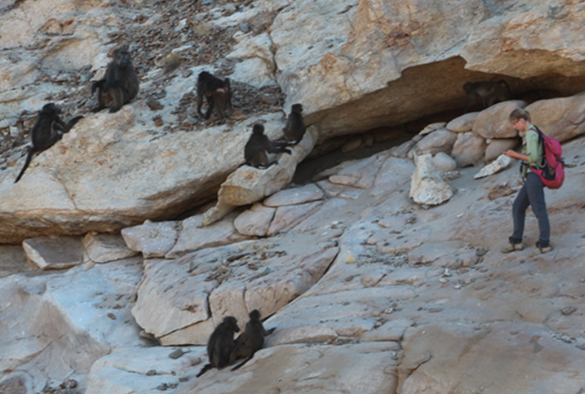 Following the baboon troops allows us to witness first-hand how these social animals deal with their daily challenges. Changes in their food and water supply can influence their ability to fight off disease, or to obtain a parasite. Social relationships, from friendships to fights, could alter the baboon’s health so we record who they interact with throughout the day. A typical day in the field involves many hours following the troops on foot; from the moment they wake to the time they settle to sleep. In addition to a record of the baboons’ daily activities and a host of environmental variables, I also need to establish the levels of their health. The easiest, and least invasive, method to determine what parasites the baboons are carrying is to collect faecal samples. Any pathogens living in the gut of the baboons can be identified from these samples, so they are incredibly useful to determine the health of each individual. Once collected, the samples are stored so they can be brought back to the UK for laboratory analysis at a later date.